I participate in several photography groups on Facebook. This week I posted a reply to a group member who was exploring stock photography. After several messages, he asked me – can I make money in stock photography from landscape and cityscape images? My response to him was that – yes, you can. But the reality is that simple landscape and cityscape images are highly competitive. There are hundreds of contributors submitting this type of material, and millions of existing images. So, it won’t be easy to create unique images that continue to be downloaded. 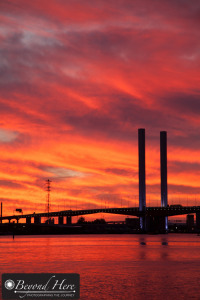 Bolte Bridge, Melbourne, Australia. A specific scene shot in dramatic light. So, if you want to generate an income from stock photography with this style of image, what is the best chance of success? Here are five suggestions for giving you the greatest chance of success. Shoot in the best light. There are likely to be hundreds of competing images to your own. Make your point of difference images shot in excellent light. This will likely mean sunrise and sunset shoot times. Shoot tourist highlights. There is ongoing demand for images which capture the icons of a city or a well known landscape. Take the time to shoot the tourist highlights of your city, or well known landscape spots. Shoot like a local. There is increasing demand for images which capture the essence of a city in a way only a local would know. Shoot the back laneways, cafes, popular meeting places. Use your local knowledge to shoot places that only a local would know. Develop an expansive body of work. What does that mean? It means you are going to stick at this. You are going to shoot different elements, in different conditions, at different times of year. It is not a random shot taken here or there, it’s about developing a range of work. Document the city or landscape year round. Cities and landscapes look very different at different times of year. Take advantage of the different seasons to add a new look to your work. And like anyone using stock photography to generate a meaningful income – you need to treat this like a business. Set a goal for how many files you plan to upload this month and this year. Work at it. Keep adding to your portfolio. Develop variety in your images. Study similar images which have been successful as stock. What are the elements you are going to emulate in your own images? And keep working at it. Stock photography is based on the idea that you will do the work now (shoot, edit and upload) and be rewarded later (downloads and income). So keep working at it. Landscapes and cityscapes are very competitive areas, but it is possible to make money in these areas. My experience is that cityscapes and specific landscape images provide better returns than very generic landscapes. Look for your image to tell a story of a specific place. This entry was posted in Landscape Photography, Stock Photography and tagged landscape photography, microstock photography, stock photography on May 8, 2016 by Craig Dingle. In the first 7 months of Beyond Here I haven’t posted often about photography techniques. I’ve assumed people running or preparing to run photography businesses have most of their technique sorted. But I had two emails this week from readers who have asked for more content on technique. It seems a light refresher is welcome. So today I have been looking through images where framing plays a role. Within those images I was looking for images where there is a strong sense of framing for impact. 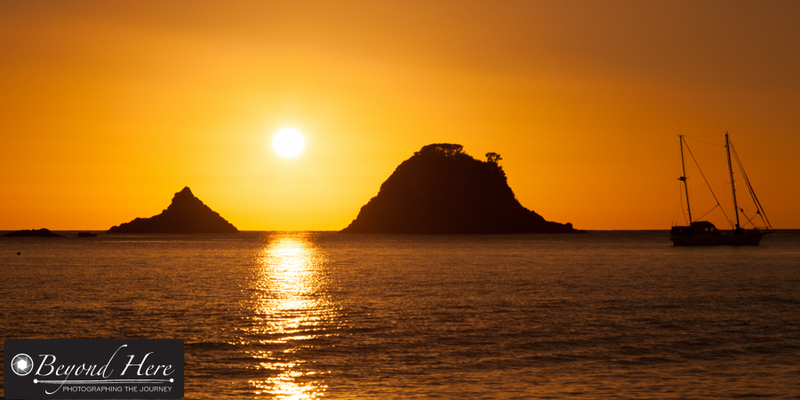 This image was taken at Hahei Beach on the east coast of New Zealand. It was shot in the early morning just before the sun came up. It is a good example of framing for impact. While the pre dawn light was beautiful, the framing from the trees helps take away a lifeless sky, and focuses attention on the island and sunrise. How do I see opportunities for framing? There are lots and lots of opportunities to use framing in your images. In this case, while I had walked along the waters edge and made some images, I knew the stronger images would be made from further back from the waters edge. Then it was just a matter of finding the right tree to really deliver ‘framing for impact’. Where else can I find opportunities for framing? Once you train yourself to look for them, you will see many opportunities for ‘framing for impact’. I shoot weddings, and classic scenes for ‘framing for impact’ are the bride and groom framed by the church door, or the bride framed by the window of the bridal car. These are good opportunities to add impact to your wedding images. I also shoot family portraits. When shooting an outdoor session with kids, I often use a playground to do portraits. Within most playgrounds you will find something to frame the child and add impact. Check out the venue in advance to plan this shot. It might be a swing, or the top of the slippery slide. 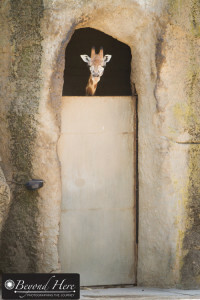 The shot shown here is a giraffe in captivity. The nature of wildlife photography can make it harder to use framing for impact, but once your eye is trained you will start to see these opportunities even in fast changing situations. Thanks for reading ‘framing for impact’. I hope it has been useful to you. If you would like to receive regular emails from Beyond Here, please add your details in the box in the margin of this page. 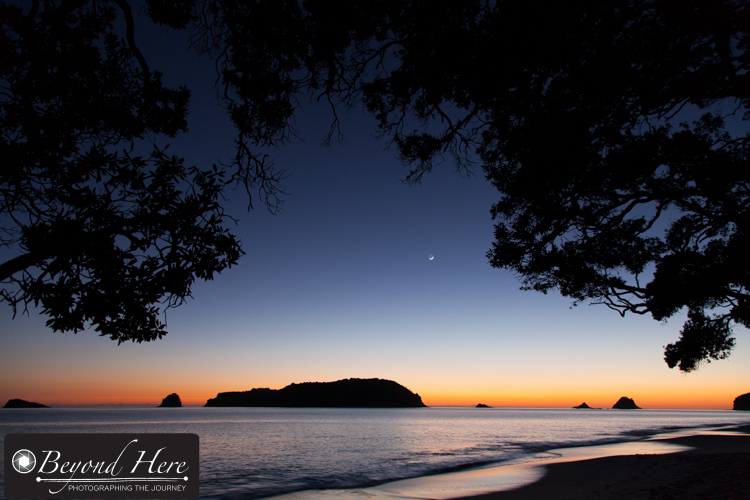 Thanks again for reading, and if you need a place to get away from it all – Hahei on the east coast of the North Island of New Zealand is a great place! This entry was posted in Landscape Photography, Photography Tips, Wildlife and tagged framing, photographic technique on December 26, 2014 by Craig Dingle. 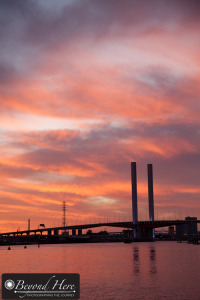 Melbourne Sunset. Looking out over Bolte Bridge. 8.41pm. 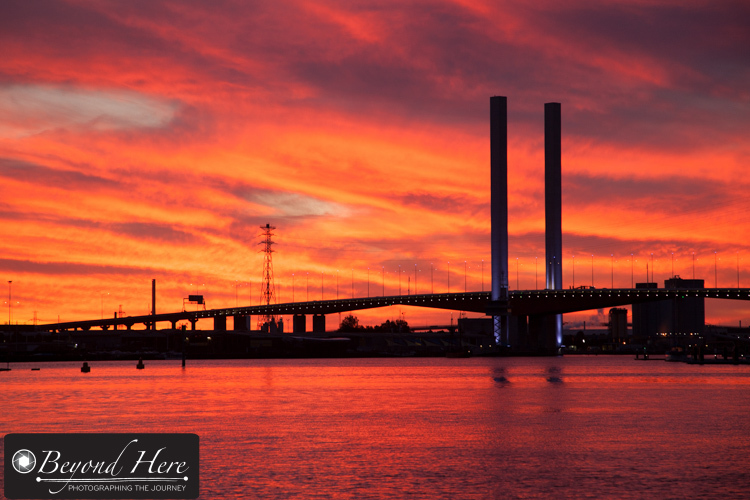 I had the good luck to be in the city in Melbourne, Australia on Tuesday this week as this sunset unfolded. I was meeting a person at 9pm and had traveled into the city early. I was there at 8.15pm and had 45 minutes to occupy myself before the meeting. I had taken my camera with the expectation of being able to do a short shoot and adding to my stock portfolio. The sunset which unfolded took most of my attention and my breath away. It reminded me of the importance of patience and timing. When I first arrived the sun was going down. There were plenty of light clouds around, but very little color in the sky. 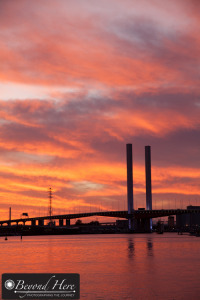 I was having a relaxing walk around the Docklands area, unaware of the spectacular sunset which was about to unfold. For most of the next 20 minutes there was little to get excited about, although there was slightly more color in the sky. Then over a brief 9 minute window I took the 5 images you see in this post. At 8.32pm there was still very little color to be seen. 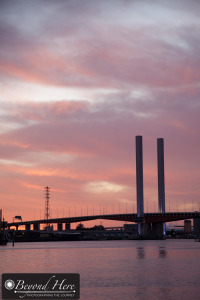 I had positioned myself at the city end of Docklands looking out towards the Bolte Bridge and the setting sun. I considered leaving as I had a 20 minute walk to my appointment. I am glad I stayed, as over the next few minutes you can see the change in color in the sky, culminating in a vivid orange and purple skyline in the vertical image here shot at 8.40pm and the horizontal one at the top of this post shot at 8.41pm. It was a good lesson in patience and timing. Landscape photographers who shoot at sunrise and sunset know this lesson well. It is worth being in position early and then being patient. Sometimes you get a spectacular scene like this and sometimes you don’t – but nothing is more frustrating than packing your gear into the car and realizing you missed a great opportunity. The lesson on patience and timing also applies to other types of photography. I shoot weddings and family portraits and there is often a split second between a great image and a bride with her eyes shut looking terrible. It seems ironic – talking about patience and timing – that I had to run to make it to my 9pm appointment. I arrived hot and sweaty, but on time and with a series of sunset images! This entry was posted in Landscape Photography, Photography Tips and tagged landscape photography, melbourne on December 13, 2014 by Craig Dingle. This post covers a way to achieve different visual effects with one image by use of creative cropping. Today, achieving different effects is straight forward – if you are not an expert in photoshop or lightroom, there are lots of simple smart phone apps you can use to crop and adjust your images. In this post we will look at one image, adjusted using creative cropping. Here is the original image. 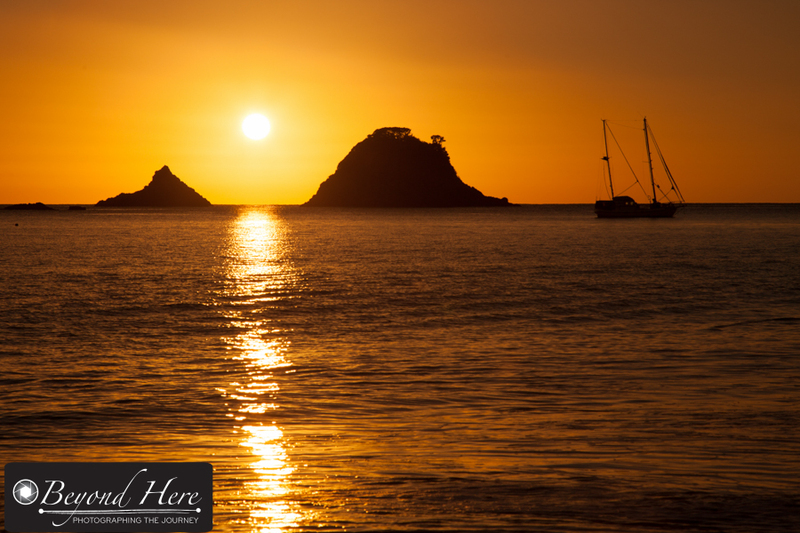 This shot was taken at Hahei Beach on the Coromandel Peninsula in the north island of New Zealand. This is a fantastic place to visit. 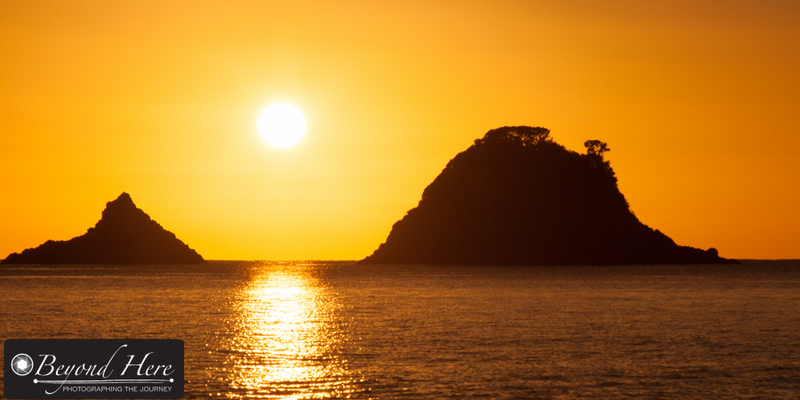 It faces east, so you see magnificent sun rises over the water. I had the good fortune to visit Hahei in March 2014 to shoot a wedding. This shot was taken on the morning of the wedding during an early morning walk on the beach. This image has several creative cropping options. Let’s look at two different horizontal options first. The first creative cropping horizontal image retains the human element by including the yacht. The second version excludes the yacht and creates a stronger feeling of nature and isolation – with a bigger role played by the golden sky. Both of these images make use of the horizontal elements of interest in the image. This type of image also has a vertical option for creative cropping. This style of creative cropping makes use of the vertical elements in the image – in this case the reflection of the sunlight on the water – which makes a pathway from the top to the bottom of the image. My favorite images here are the second horizontal crop, and the vertical image. I like the simplicity the creative cropping has brought, and the strong role played by the golden colors. Which is your favorite? 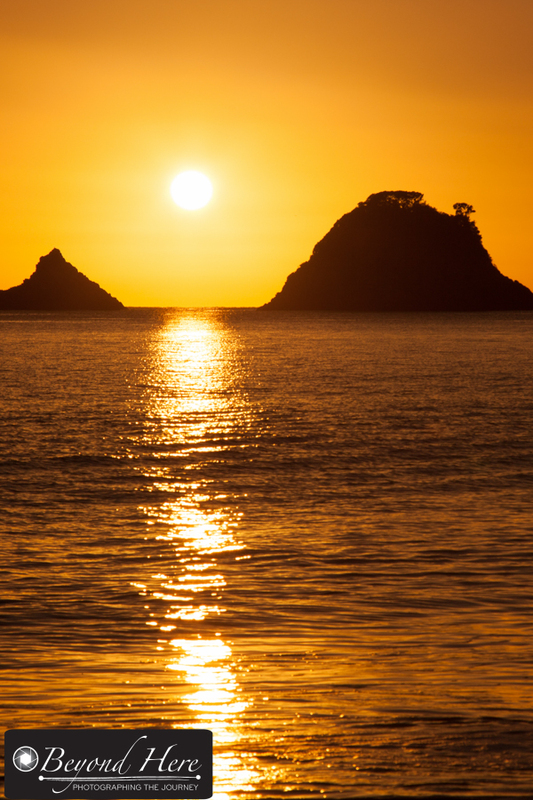 This entry was posted in Landscape Photography, Photography Tips and tagged Coromandel Peninsula, dawn, gold, Hahei, Hahei Beach, landscape photography, New Zealand, photograph, photography, seascape, sunrise, twilight, yellow on June 29, 2014 by Craig Dingle.